Since the last patch, there have been 580 commits to Blade Symphony from our developers. We've been busy. This new game mode splits players into two teams vying to hold multiple control points. Players will parkour over shipping containers, fighting over sky towers and arenas to hold these control points from the other team. 3 new maps have been made specially for this game mode: terrace, a map that plays with vertigo; sequence, where chokepoints become important; and docks, an open map with both indoors and outdoors combat. Each character in the game now have separate attachments that you can install. These cosmetic attachments are integrated with Steam Workshop so players can create their own skins, armor, and anything you can imagine. To date, players have created 589 pieces of content, including swords, masks, maps, and graphics modifications. Added capture point game mode. 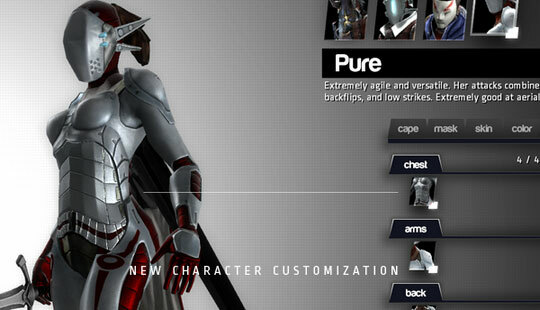 Players can now further customize their characters by adding or removing Workshop skins and attachments. Added ability to team chat (if you have a pre-existing config, you’ll need to bind it manually via the console). If a player is on blue team, their dash cancel will glow blue instead of red. Added kill notifications into the chat window. Fall damage is now applied if a player is falling fast enough after being hit with a shuriken or thrown. Added Control Point game mode to host menu. Added server browser details screen. Added chase cam spectator mode for 2on2 and 2on1. Wall flip now uses keyboard directional input to determine direction/velocity. Players can now climb ledges while just holding forward. Added 'diminishing return' mechanic to wallruns, being unable to continue after 5 wall runs. Added wall sliding mechanic. If a player’s wallrun ends, they will then begin sliding down the wall. Updated models and materials for all characters. Characters now have individual attachments across 4 slots. Pure now has death animations. Wall jump animations have been updated. Made dropped sword entity play sheathed idle animation by default. Added Deploy and Retract sounds to Stacatto Black Sword. Added attachments on customization screen. Corrected an error with Riot Knight skin self-illumination. If a player is glow in FFA or teamplay, the dash cancel proxy will be twice as strong. Shorter male death animations to prevent ragdolls from flipping. Removing all client tracers in interrupt (except tracer parry) to reduce glitchy looking tracers. 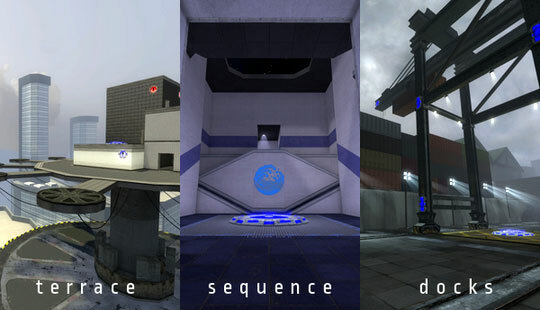 Added two new FFA maps: free_temple and free_district are both free-for-all versions of their duel counterparts. Added berimbau_capture_point entity, for use in cp_ maps. func_instance is fixed and now works with Blade Symphony. Added Enable/Disable functionality to berimbau_spawns, so now you can define different spawn zones (i.e. after a control point switches teams). Can no longer wallrun on sky brushes. Added ability to choose training map. Minor visual and skybox improvements to Tutorial map. Added subscribed state for workshop visibility. Added workshop jiggle bone warning, removed LOD warning. Put all new workshop constraints or constraint changes behind a workshop ID check, so all existing times will not be validated against any new rules when they are loaded by the client (current ID is 304077814). Fixed custom skins sometimes not being applied when switching between characters. Removed stance speed modifier (it was basically unused, except that it broke move params). Fixed sword not returning to idle anim when attacking from sheathed state. Fixed controlled animation move not reaching 100% on move_x when going backwards. Fixed dash cooldown effect not animating on remote players. Removed cheat flag from kill cmd. Fixed a memory leak issue in the SDK. Added temporary IP ban to vote kick to prevent ban avoidance. Attempted to fix a bug that causes the player to be locked in the air stance.